A Minister of the Crown or a Mining Magnate? Today, RM was provided a copy of a letter suggesting the new South Australian Mining & Energy Minister Dan Van Holst Pellekaan, has been making illegal and unlawful decisions in relation to the controversial CSG Mine approvals located north of Leigh Creek in the Flinders Ranges. The controversial mine approvals have created fierce opposition from the small local communities and the traditional Adnyamathanha owners of the land, concerned the controversial process of UCG ( underground coal gasification) could lead to a similar disaster to the LINC Energy Chinchilla UCG disaster which has devastated 300 square plus kilometers of land and continues to contaminate groundwater. Very serious matters regarding the conduct of the Minister this year and last year are pending investigation by the Ombudsman Office and the Office of Public Integrity. They have been terrific, but have a lot of paper work from the Premiers Office to wade through before announcing formal decisions. Then Environmental Manager of Linc Energy, Mr Justyn Daniel Peters, is now the CEO of the Leigh Creek Energy Project syngas operation – which has, according to the letter provided, no license to operate and is therefore an illegal operation continuing under the false sanction of the Minister Pellekaan. The William Light Foundation (WLF) has been most blessed with the kind support of law firms from Victoria (Clemens Haskin Legal), NSW (Environmental Defenders Office), SA (Environmental Defenders Office) and Campbell Law (for Angumathanha Camp Law mob). 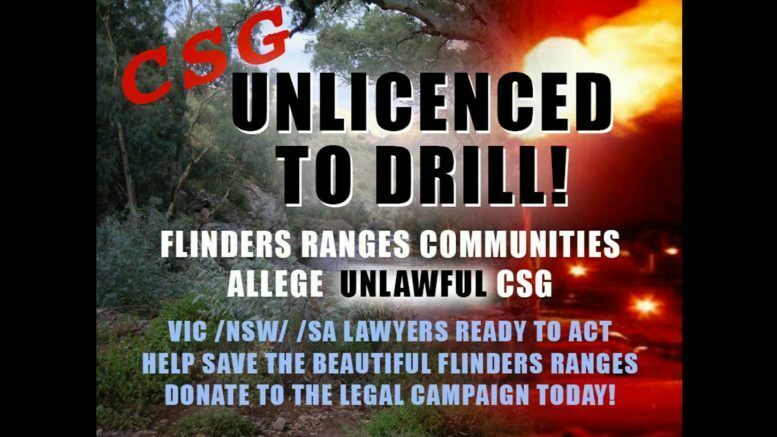 To all of these highly skilled, passionate and caring lawyers we say thanks for representing the case of the Flinders Ranges Communities that has been ignored by the media largely to date. We do thank the ABC 4Corners research team that have taken an interest in the myriad links between this outfit and the Linc Energy QLD outfit found guilty on five accounts of wilful criminal negligence. We are now ready for action to challenge not just the proponent of this proven to be dangerous and hazardous mining practice but also the Minister of Mining and Energy (the not so Hon Dan Van Holst Pellekaan) who also happens to be our local member but has woefully failed his basic oath of duty to represent the communities and the traditional custodians of this wonderful place, the Flinders Ranges. We now humbly ask your support to donate what you can afford and to also share this campaign widely via your email and social media connections to help ensure the campaign is a success, and send a firm message to the politicians of Australia and their vested interest hand maidens that destroying the great artesian basin and the connected basins, and species dependent on them is certainly not OK under any circumstances and that a final nation wide ban on unconventional gas (CSG ,UCG, Fracking) must be legislated sooner than later… before Australia becomes a barren wasteland…..
To all of those that have given generously already, we thank you so very much for your support which has enabled us this small window of opportunity to prevent this reckless Minister from destroying this wonderful place, our home, the Flinders Ranges. Now is not the time for us to speculate the outcomes of the Ministers errors or why he made them, we await the outcomes from the Ombudsman’s Office, OPI and the remaining matters are in the hands of the lawyers representing the Flinders Ranges Communities.